I recommend this spot because the location is amazing for those who love industrial archeology, those who love cultural spaces surviving in the peripheral streets of old popular neighborhoods, and those who love theater and all kinds of art. If on some night I feel like being entertained by a live show, Teatro India is my first choice to see what’s happening around. 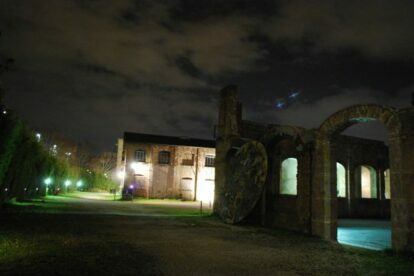 This art temple arose from the ashes of the former factory Mira Lanza, which used to produce soap until 1955. Standing at the door you will be overcome by a feeling of being suspended in space and time and enveloped in silence. Thank God the cultural institutions of the city have taken back the area for the community and so can provide us with a good, international choice of plays, events, dance performers and music. Reaching this spot by bicycle is also a good idea, because on this specific path you can first immerse yourself in glorious Roman industrial history and see the big Gazometro tower, another testament to this golden moment in Rome’s past, then get to the Tevere river to Trastevere.